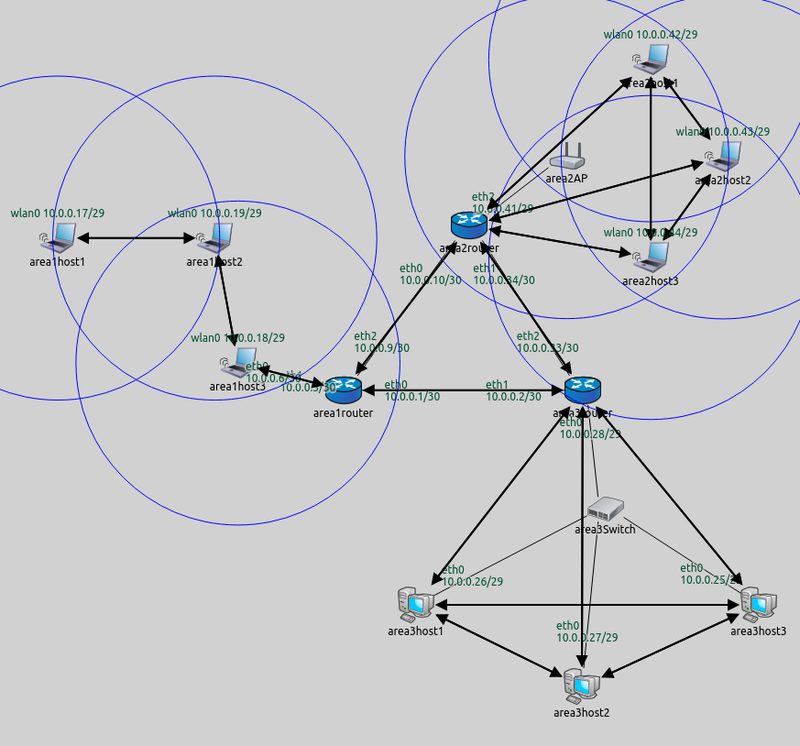 Sometimes it is best to configure different parts of a network according to different metrics. This step demonstrates using the hop count and error rate metrics in a mixed wired/wireless network. The core of the network is composed of three routers connected to each other, each belonging to an area. There are three areas, each containing a number of hosts, connected to the area router. Area1 is composed of three WirelessHosts, one of which is connected to the router with a wired connection. Area2 has an AccessPoint and three WirelessHosts. Area3 has three StandardHosts connected to the router via a switch. There is no access point in area 1, the hosts form an ad-hoc wireless network. They connect to the rest of the network through area1host3, which has a wired connection to the router. However, area1host3 is not in the communication range of area1host1 (illustrated on the image below.) 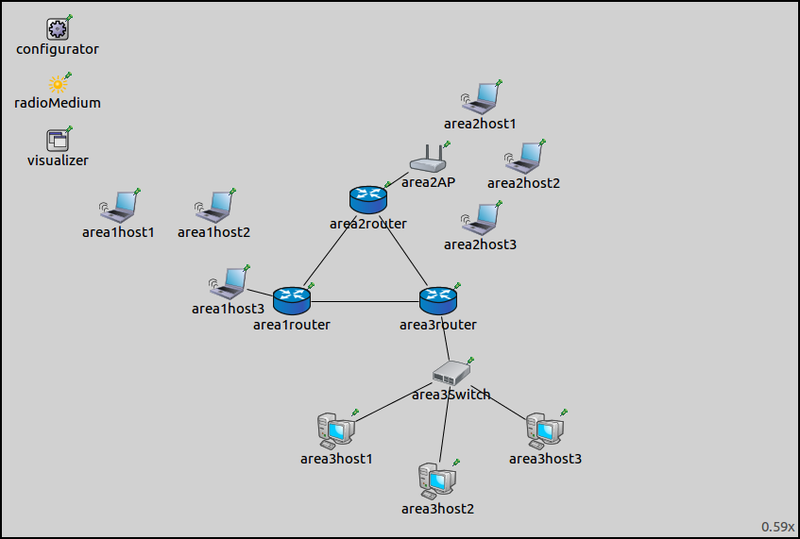 Thus, area1host2 needs to be configured to forward area1host1’s packets to area1host3. The error rate metric, rather than hop count, is best suited to configure routes in this LAN. Routes in the rest of the network can be configured properly based on the hop count metric. description = "Mixing different kinds of autorouting"
For hosts in area 1 to operate in ad-hoc mode, IP forwarding is turned on, and their management modules are set to ad-hoc management. 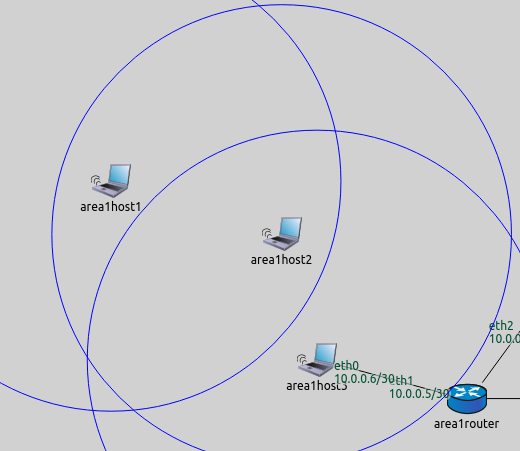 area1host1 is configured to ping area2host1, which is on the other side of the network. Routes to all hosts and communication ranges are visualized. To have routes from every node to every other node, all nodes must be covered by an autoroute element. The XML configuration contains two autoroute elements. Routing tables of hosts in area 1 are configured according to the error rate metric, while all others according to hop count. The global addStaticRoutes, addDefaultRoutes and addSubnetRoutes parameters can be also specified per interface, with attributes of the <interface> element. The attribute names are add-static-route, add-default-route and add-subnet-route, and they are all booleans with true as default value. The global and per-interface settings are in a logical AND relationship, so both have to be true to take effect. The default route assumes there is one gateway, and all nodes on the link can reach it directly. This is not the case for area 1, because area1host1 is out of range of the gateway host. The add-default-route parameter is set to false for the area 1 hosts. The routes are visualized on the following image. As intended, area1host1 connects to the network via area1host2. The gateway is 10.0.0.19 (area1host2) in all rules, except in the one where it is *. That rule is for reaching the other hosts in the LAN directly. This doesn’t seem to be according to the error rate metric, but the * rule matches destinations 10.0.0.18 and 10.0.0.19 only. Since 10.0.0.18 is covered by a previous rule, this one is actually for reaching 10.0.0.19 directly.